Summer is here. As usual, your kids would be looking forward to a lot of dhamaal and you as parents would be hunting summer camps and things to keep your child meaningfully engaged. Learn a bit of teamwork, a bit of adventure, some new skills, make new friends etc etc etc... Right? Well then here it is! An activity which combines it all. Yes, you read it right “No Aaicha Raag” or “No Babancha Dhaak”. Three hours of fun, adventure and your favourite yummy snacks in the end. Height limit : Minimum 110cm (Kids below 110cm height will not be allowed entry). OPEN TO MMS MEMBER'S KIDS ONLY. Participation confirmed only after successful payment (ONLINE preferred) by 15th May. 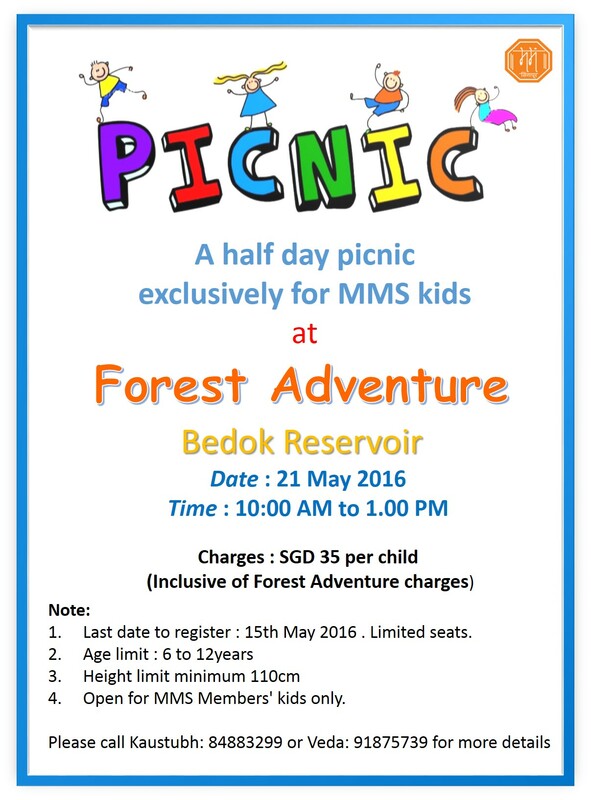 You can find more details about forest Adventure at https://forestadventure.com.sg/. Please call Kaustubh: 84883299 or Veda: 91875739 for your queries. More details about the outing will be sent to confirmed registrants. Hurry ! Register before we are full ! !